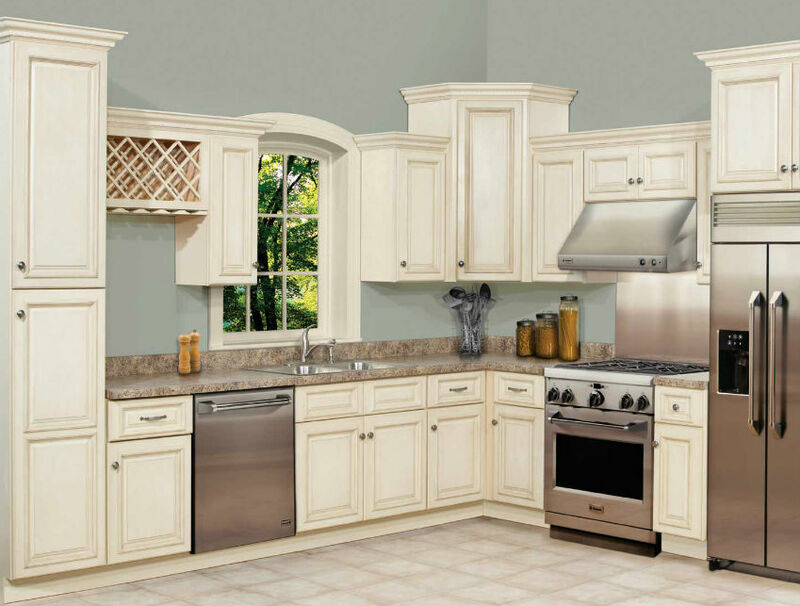 The Tuscany White Maple Kitchen Cabinets are a beautiful addition to any kitchen. When shopping online for kitchen cabinets at Kitchen Cabinet Warehouse, remember that we offer free design services. All of our pieces are all wood kitchen cabinets that are ready-to-assemble. You can order a sample of these white maple RTA kitchen cabinets prior to purchasing the entire kitchen. Tuscany White Maple Large Wall Cabinet Unit with Double Door. Width 24" x Height 30" x Depth 12" . Tuscany White Maple Small Wall Cabinet Unit with Single Door. Width 24" x Height 36" x Depth 12"
Tuscany White Maple Large Wall Cabinet Unit with Double Doors. Width 24" x Height 42" x Depth 12"
Tuscany White Maple Large Wall Cabinet Unit with Double Door. Width 27" x Height 30" x Depth 12"
Tuscany White Maple Small Wall Cabinet Unit with Single Door. Width 27" x Height 36" x Depth 12"
Tuscany White Maple Large Wall Cabinet Unit with Double Doors. Width 27" x Height 42" x Depth 12"
Tuscany White Maple Large Wall Cabinet Unit with Double Door. Width 30" x Height 30" x Depth 12"
Tuscany White Maple Small Wall Cabinet Unit with Single Door. Width 30" x Height 36" x Depth 12" . Tuscany White Maple Large Wall Cabinet Unit with Double Doors. Width 30" x Height 42" x Depth 12"
Tuscany White Maple Large Wall Cabinet Unit with Double Door. Width 33" x Height 30" x Depth 12"
Tuscany White Maple Small Wall Cabinet Unit with Single Door. Width 33" x Height 36" x Depth 12"
Tuscany White Maple Large Wall Cabinet Unit with Double Doors. Width 33" x Height 42" x Depth 12"
Tuscany White Maple Large Wall Cabinet Unit with Double Door. Width 36" x Height 30" x Depth 12" . Tuscany White Maple Small Wall Cabinet Unit with Single Door. Width 36" x Height 36" x Depth 12"
Tuscany White Maple Large Wall Cabinet Unit with Double Doors. Width 36" x Height 42" x Depth 12"
Tuscany White Maple Large Wall Cabinet Unit with Double Door. Width 42" x Height 30" x Depth 12"
Tuscany White Maple Large Wall Cabinet Unit with Double Doors. Width 42" x Height 42" x Depth 12"
Tuscany White Maple Large Blind Wall Cabinet Unit with Double Door. Width 27" x Height 30" x Depth 12"
Tuscany White Maple Small Wall Cabinet Unit with Single Door. Width 12" x Height 30" x Depth 12"
Tuscany White Maple Small Wall Cabinet Unit with Single Door. Width 12" x Height 36" x Depth 12"
Tuscany White Maple Small Wall Cabinet Unit with Single Door. Width 12" x Height 42" x Depth 12"
Tuscany White Maple Small Wall Cabinet Unit with Single Door. Width 15" x Height 30" x Depth 12"
Tuscany White Maple Small Wall Cabinet Unit with Single Door. Width 15" x Height 36" x Depth 12"
Tuscany White Maple Small Wall Cabinet Unit with Single Door. Width 15" x Height 42" x Depth 12"
Tuscany White Maple Small Wall Cabinet Unit with Single Door. Width 18" x Height 30" x Depth 12"
Tuscany White Maple Small Wall Cabinet Unit with Single Door. Width 18" x Height 36" x Depth 12"
Tuscany White Maple Small Wall Cabinet Unit with Single Door. Width 18" x Height 42" x Depth 12"
Tuscany White Maple Small Wall Cabinet Unit with Single Door. Width 21" x Height 30" x Depth 12"
Tuscany White Maple Small Wall Cabinet Unit with Single Door. Width 21" x Height 36" x Depth 12"
Tuscany White Maple Small Wall Cabinet Unit with Single Door. Width 21" x Height 42" x Depth 12"
Tuscany White Maple Small Wall Cabinet Unit with Single Door. Width 9" x Height 30" x Depth 12"
Tuscany White Maple Small Wall Cabinet Unit with Single Door. Width 9" x Height 36" x Depth 12"
Tuscany White Maple Small Wall Cabinet Unit with Single Door. Width 9" x Height 42" x Depth 12"
Tuscany White Maple Small Base Unit with 3 Drawers, 15 Inches wide (no doors). Width 15" x Height 34.5" x Depth 24"
Tuscany White Maple Small Base Unit with 3 Drawers, 18 Inches wide (no doors). Width 18" x Height 34.5" x Depth 24"
Tuscany White Maple Small Base Unit with 3 Drawers, 21 Inches wide (no doors). Width 21" x Height 34.5" x Depth 24"
Tuscany White Maple Large Base Unit with 3 Drawers, 30 Inches wide (no doors). Width 30" x Height 34.5" x Depth 24"
Tuscany White Maple Base Filler Piece. Width 34.5" x Height 3" x Depth .05"
Tuscany White Maple Straight Wall Filler Piece. Width 30" x Height 3" x Depth .05"
Tuscany White Maple Straight Wall Filler Piece. Width 42" x Height 6" x Depth .05"
Tuscany White Maple Angle Corner Base Cabinet Unit with False Door. Width 24" x Height 34.5" x Depth 24"
Tuscany White Maple Decorative Door For Side of Base Cabinet. Width 24" x Height 30"
Tuscany White Maple Base End Panel. Width 24" x Height 34.5" x Depth .25"
Tuscany White Maple Panel for Diagonal Sink with One Door and False Drawer. Width 17" x Height 34.5"
Tuscany White Maple Decorative Door For Side of Cabinet. Width 12" x Height 30"
Tuscany White Maple Decorative Door For Side of Cabinet. Width 12" x Height 36"
Tuscany White Maple Decorative Door For Side of Cabinet. Width 12" x Height 42"
Tuscany White Maple Crown Molding. Decorative Top for Cabinets. Width 96" x Height 4" x Depth 1"
Tuscany White Maple Diagonal Corner Wall Cabinet Unit with Single Door. Width 27" x Height 42" x Depth 12"
Tuscany White Maple Diagonal Corner Wall Cabinet Unit with Single Door. Width 24" x Height 30" x Depth 12"
Tuscany White Maple Diagonal Corner Wall Cabinet Unit with Single Door. Width 24" x Height 36" x Depth 12"
Tuscany White Maple Diagonal Corner Wall Cabinet Unit with Single Door. Width 24" x Height 42" x Depth 12"
Tuscany White Maple Mullion Glass Door with Grid for Diagonal Wall Cabinet. Width 24" x Height 30"
Tuscany White Maple Diagonal Mullion Glass Door with Grid. Width 24" x Height 42"
Tuscany White Maple Diagonal Mullion Glass Door with Grid. Width 27" x Height 42"
Tuscany White Maple End Panel to cover exposed side of Dishwasher. Width 24" x Height 34.5" x Depth .75"
Tuscany White Maple Fridge Panel. Width 24" x Height 84" x Depth .75"
Tuscany White Maple Fridge Panel. Width 24" x Height 90" x Depth .75"
Tuscany White Maple Fridge Panel. Width 24" x Height 96" x Depth .75"
Tuscany White Maple Overhead Horizontal Fridge Wall Cabinet. Width 33" x Height 12" x Depth 24"
Tuscany White Maple Overhead Horizontal Fridge Wall Cabinet. Width 33" x Height 15" x Depth 24"
Tuscany White Maple Overhead Horizontal Fridge Wall Cabinet. Width 33" x Height 24" x Depth 24"
Tuscany White Maple Overhead Horizontal Fridge Wall Cabinet. Width 36" x Height 15" x Depth 24"
Tuscany White Maple Overhead Horizontal Fridge Wall Cabinet. Width 36" x Height 24" x Depth 24"
Tuscany White Maple Overhead Horizontal Wall Cabinet. Width 24" x Height 15" x Depth 12"
Tuscany White Maple Overhead Horizontal Wall Cabinet. Width 30" x Height 12" x Depth 12"
Tuscany White Maple Overhead Horizontal Wall Cabinet. Width 30" x Height 15" x Depth 12"
Tuscany White Maple Overhead Horizontal Wall Cabinet. Width 30" x Height 18" x Depth 12" . Tuscany White Maple Overhead Horizontal Wall Cabinet. Width 30" x Height 24" x Depth 12"
Tuscany White Maple Overhead Horizontal Wall Cabinet. Width 33" x Height 15" x Depth 12"
Tuscany White Maple Overhead Horizontal Wall Cabinet. Width 36" x Height 12" x Depth 12"
Tuscany White Maple Overhead Horizontal Wall Cabinet. Width 36" x Height 15" x Depth 12"
Tuscany White Maple Overhead Horizontal Wall Cabinet. Width 36" x Height 24" x Depth 12"
Tuscany White Maple 3ft x 4ft panel used to cover back side of Kitchen Island. Width 36" x Height 48" x Depth .25"
Tuscany White Maple Large Base Cabinet with Double Doors & Two Drawers . Width 36" x Height 34.5" x Depth 24"
Tuscany White Maple Large Base Cabinet Double Doors & Two Drawers - 42 Inch Width. Width 42" x Height 34.5" x Depth 24"
Tuscany White Maple Light Rail Molding. Decorative Bottom for Cabinets. Width 84" x Height 2" x Depth 1"
Tuscany White Maple Medium Base Cabinet with Double Doors & Single Drawer. Width 24" x Height 34.5" x Depth 24"
Tuscany White Maple Medium Base Cabinet with Double Doors & Single Drawer. Width 27" x Height 34.5" x Depth 24"
Tuscany White Maple Medium Base Cabinet with Double Doors & Single Drawer. Width 30" x Height 34.5" x Depth 24"
Tuscany White Maple Shelf used to hold Microwave. Width 30" x Height 18" x Depth 12"
Tuscany White Maple Mullion Diagonal Glass Door with Grid. Width 24" x Height 36"
Tuscany White Maple Mullion Glass Door with Grid. Width 15" x Height 30"
Tuscany White Maple Mullion Glass Door with Grid. Width 15" x Height 36"
Tuscany White Maple Mullion Glass Door with Grid. Width 15" x Height 42"
Tuscany White Maple Mullion Glass Door with Grid. Width 18" x Height 30"
Tuscany White Maple Mullion Glass Door with Grid. Width 18" x Height 42"
Tuscany White Maple Mullion Glass Door with Grid. Width 30" x Height 30"
Tuscany White Maple Mullion Glass Door with Grid. Width 30" x Height 36"
Tuscany White Maple Mullion Glass Door with Grid. Width 30" x Height 42"
Tuscany White Maple Mullion Glass Door with Grid. Width 36" x Height 30"
Tuscany White Maple Mullion Glass Door with Grid. Width 36" x Height 36"
Tuscany White Maple Mullion Glass Door with Grid. Width 36" x Height 42"
Tuscany White Maple Outside Corner Molding. Decorative Bottom for Cabinets. Width 84" x Height 0.5" x Depth 0.5"
Tuscany White Maple Oven Cabinet Unit. Width 33" x Height 84" x Depth 24"
Tuscany White Maple Oven Cabinet Unit. Width 33" x Height 90" x Depth 24"
Tuscany White Maple Pantry Cabinet Unit. Width 18" x Height 84" x Depth 24"
Tuscany White Maple Pantry Cabinet Unit. Width 18" x Height 90" x Depth 24"
Tuscany White Maple Pantry Cabinet Unit. Width 18" x Height 96" x Depth 24"
Tuscany White Maple Pantry Cabinet Unit. Width 24" x Height 84" x Depth 24"
Tuscany White Maple Pantry Cabinet Unit. Width 24" x Height 90" x Depth 24"
Tuscany White Maple Pantry Cabinet Unit. Width 24" x Height 96" x Depth 24"
Tuscany White Maple Shelf used to hold / store plates. Width 30" x Height 15" x Depth 12"
Tuscany White Maple Scalloped Filler Piece. Width 48" x Height 3" x Depth .05"
Tuscany White Maple Scribe Molding. Cover Piece for seam of cabinet panel. Width 84" x Height 0.5" x Depth 0.5"
Tuscany White Maple Sink Base Unit with 2 False Drawers. Width 30" x Height 34.5" x Depth 24"
Tuscany White Maple Sink Base Unit with 2 False Drawers. Width 33" x Height 34.5" x Depth 24"
Tuscany White Maple Sink Base Unit with 2 False Drawers. Width 36" x Height 34.5" x Depth 24"
Tuscany White Maple Sink Base Unit with 2 False Drawers. Width 42" x Height 34.5" x Depth 24"
Tuscany White Maple Sink Base Unit with 2 False Drawers. Width 60" x Height 34.5" x Depth 24"
Tuscany White Maple Small Base Cabinet with 12 Inch Door & Drawer. Width 12" x Height 34.5" x Depth 24"
Tuscany White Maple Small Base Cabinet with 21 Inch Door & Drawer. Width 21" x Height 34.5" x Depth 24"
Tuscany White Maple Small Base Cabinet Unit with Single 9 Inch Door Only (Full Height). Width 9" x Height 34.5" x Depth 24"
Tuscany White Maple Wine Glass Holder for placement under bottom of Wall Cabinets Width 30" x Height 15" x Depth 12"
Tuscany White Maple Straight Corner Blind Base Cabinet 42 to 45 Inches Width 42" x Height 34.5" x Depth 24"
Tuscany White Maple Straight Filler Piece. Width 48" x Height 3" x Depth .05"
Tuscany White Maple Toe Kick. Covers base Molding of Cabinet. Width 96" x Height 4". Item is 1/4" in thickness. Tuscany White Maple Wall End Panel. Width 12" x Height 42" x Depth .25"
Tuscany White Maple Wine Rack. Width 30" x Height 15" x Depth 12"